Spinal muscular atrophy (SMA) is a genetic disorder that occurs because of mutation in the nervous system. It happens in the gene which is known as survival motor neuron gene 1 (SMN1). This gene is responsible for producing the protein that controls healthy muscle movement. Most cells that are responsible for muscle movements and response is situated in the spinal cord. It justifies the inclusion of the word “spinal” when describing the disorder. Atrophy is a medical term that means “becoming smaller” which signifies the condition of inactive muscles. One of the common causes is genetic and inherited from parents. For a child to develop spinal muscular atrophy, there is a mutated copy of gene involved from both the parents. The most common SMA (Type 1-4) is caused by mutation on SMN1 gene on chromosome 5. This results in a deficiency of survival of motor neuron (SMN), which is a motor neuron protein responsible for flexible muscle movements and mobility. The reasons for varied levels of severity is due to the variations in another gene called SMN 2 which is also on chromosome 5. This gene also produces SMN protein but mostly non-functional. But still, a small percentage of it would be functional enough to promote muscle movement. Now, in some people there will be multiple number of SMN2 genes. Protein from all these SMN2 genes can improve someone’s SMA symptoms as more proteins means, better muscle strength and movement. Only a genetic test can confirm how many SMN2 genes are present in someone and calculate the amount of protein that would be generated. Other than genetic factors scientists don’t have evidence to prove that any other factor can contribute to spinal muscular atrophy. It is another issue that symptoms may appear during various time periods of someone’s life and the severity differs from one person to another. But the underlying cause is mostly genetic and inherent. 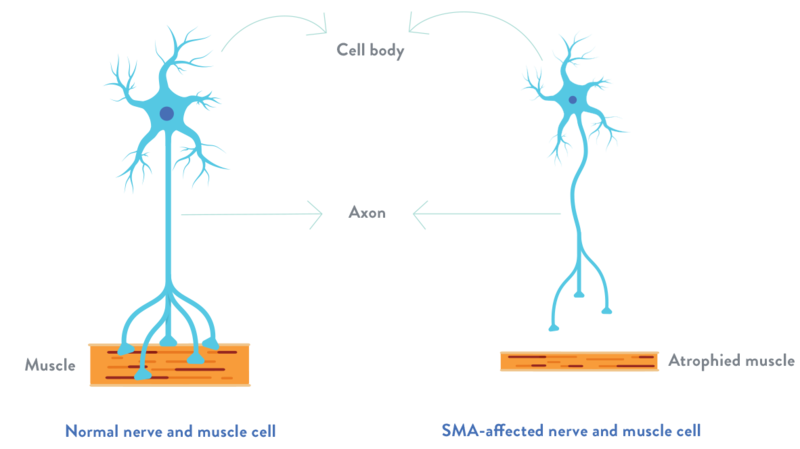 The symptoms of spinal muscular atrophy can vary from mild to severe depending on the type of the SMA and also the age of the patient. Since it directly affects the muscles, the primary symptom is muscle weakness. The most severely affected muscles are the ones that are connected to the spinal cord. Hips, thighs, shoulders and upper back are affected the most. Depending upon which muscle is the most affected one, symptoms can further vary from person to person. For example, if the respiratory muscles are affected, it will result in serious breathing and swallowing issues. If upper back is affected most, it will cause spinal curvatures and posture issues. The distal muscles are least affected or sustain longer for people who have SMA. These are muscles that are farther away from the spinal cord or the central part of the body. Leg muscles, hands etc. are some of those muscles. Hands said to last longer than any other muscles in the body part. However, the mental, emotional and sensory functioning are completely normal in people with SMA. Studies have shown that a considerable minority of male patients suffered from abnormally low testosterone levels. The most dangerous and complicated effects of SMA on the body is the muscle weakness which robs off even the ability to breath properly, let alone walk, stand or perform functionally. The respiratory system suffers immensely and should be cared for lifetime. Signs of respiratory issues are severe headache, inability to sleep at night and difficulty to concentrate. There are higher chances of infections also so precautions are necessary. Another serious aftermath is spinal curvature. It is usually called Scoliosis. This is caused because the spine is usually supported by muscles and SMA reduces the muscle strength considerably. This condition is very uncomfortable causing postural issues, difficulty to move around, and altering the person’s body image. Scoliosis can show up early in one’s lifetime, usually in the adolescence and can be resisted effectively though physiotherapy and using braces until a surgery is performed in the adult stage. The initial step of diagnosis is usually a complete and thorough physical inspection to understand the symptoms. Some practitioners would also enquire about family history as SMA is mostly genetic and inherent from parents. Genetic testing of the chromosome 5 is the most accurate way to diagnose SMA type 1 to 4. It is done through a blood test. For SMA to occur in a person, 2 defective or mutated genes should be present. Usually both the parents contribute each of these two genes for a child to have the disorder. But sometime, one parent contributes one flawed gene and the fetus carries the other one to develop the disease. Usually people who has a single gene flaw are usually termed as carriers and would be absolutely normal and healthy. Such carriers are revealed only when a child with disorder is born and the family is being tested for flawed genes. So in almost all the cases, the entire family, sometimes the extended family would be asked to undergo a genetic test to diagnose SMA and the type. For respiratory complaints: People with SMA face serious respiratory issues due to weakness of muscles that support breathing. Technology advancement has brought effective solutions in recent years in the form of portable ventilation devices for both infants and adults with SMA. Some doctors suggest providing noninvasive ventilation that allows natural air to flow through a mask to assist the patient’s breathing. Spinal curvature and back-muscle weakness: This symptom usually develops in the early stages of a person’s life. Spinal curvatures can be combatted with physiotherapy and using a back brace. However, surgery is the only solution that can offer a permanent change of this condition. Spinal muscular atrophy is a condition that can happen to 1 in every 6000 newborns, according to studies. It is not a controllable disorder with medications or therapy due to genetic involvement and often leads to early death. On a positive note, modern research and technologies are slowly proving to be effective in increasing the lifespan of SMA patients. Previous articleStop Dreaming of Success! !